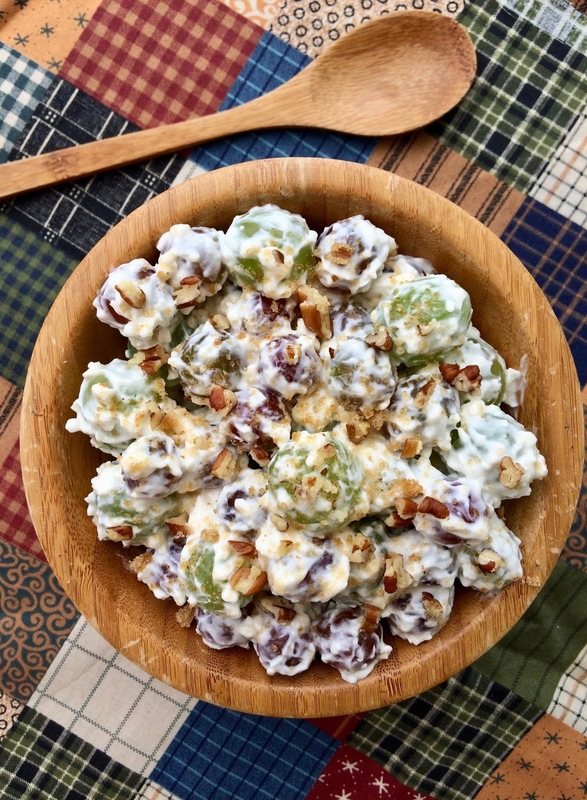 Make this cool and creamy side dish for your next cookout or picnic! I'm sharing this classic grape salad as part of my #CookoutWeek recipe contributions (don't forget to enter the exciting GIVEAWAY). 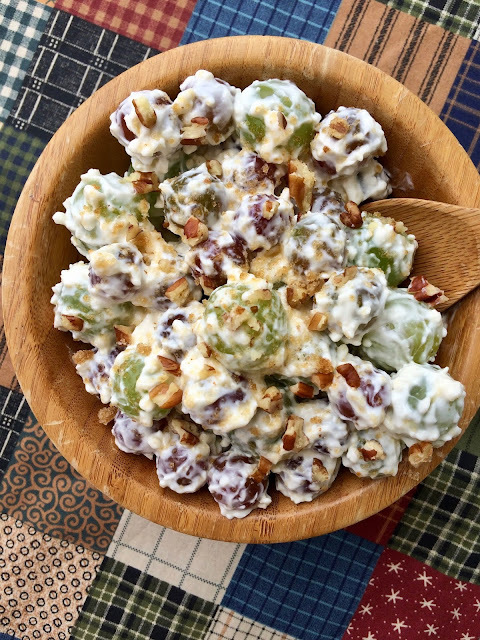 There are versions of this recipe floating around all over the web and probably in many people's own family collections, so I don't know exactly where it originated, but this is the version I make since discovering it last summer. Gasp?!?! Last summer, you say?!?! Yes, last summer was the first time I had ever seen or tried this grape salad and now I'm hooked. So, this is the perfect time to share it with all of you. It's so easy to throw together plus it's nice and cool for a hot day. Get the firmest grapes you can find - it makes a difference - you want them to "pop" in your mouth (not squish) when you bite them! This recipe will make enough to feed a crowd - probably about 20 people as a side. It's always a winner at our family gatherings. Wash the grapes and remove all stems. Dry the grapes. In a large bowl, beat the cream cheese through vanilla with a hand mixer until well-combined and smooth. Fold in the grapes until coated. Transfer to serving bowl, cover, and refrigerate for several hours before serving. Sprinkle with the brown sugar and pecans right before serving. Check out all of today's #CookoutWeek recipes below! Have never had grapes prepared this way...must be really delicious with that sweet tangy creamy sauce. I vaguely remember a salad like this from when I was a kid. I had forgotten all about it. This is quite different from any salad I've seen. 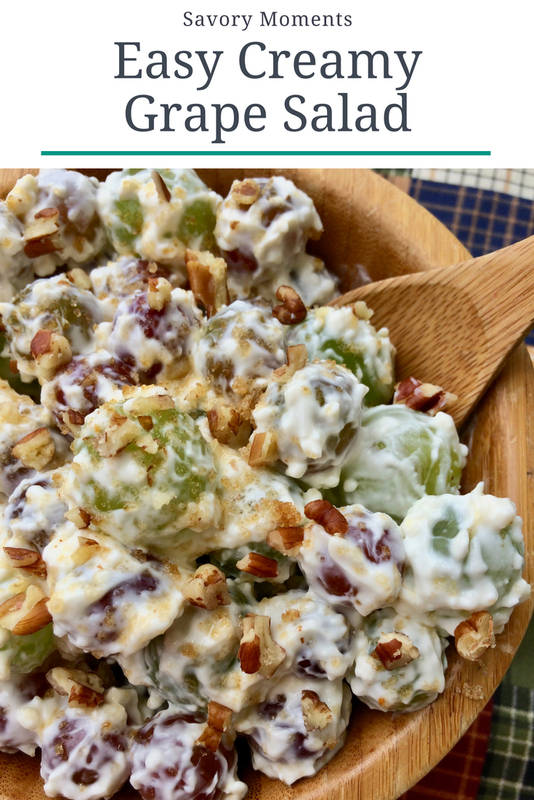 I love grape salads and the sauce on this with the sour cream and cream cheese sounds awesome! Just love all the flavors and textures in this, sounds amazing!